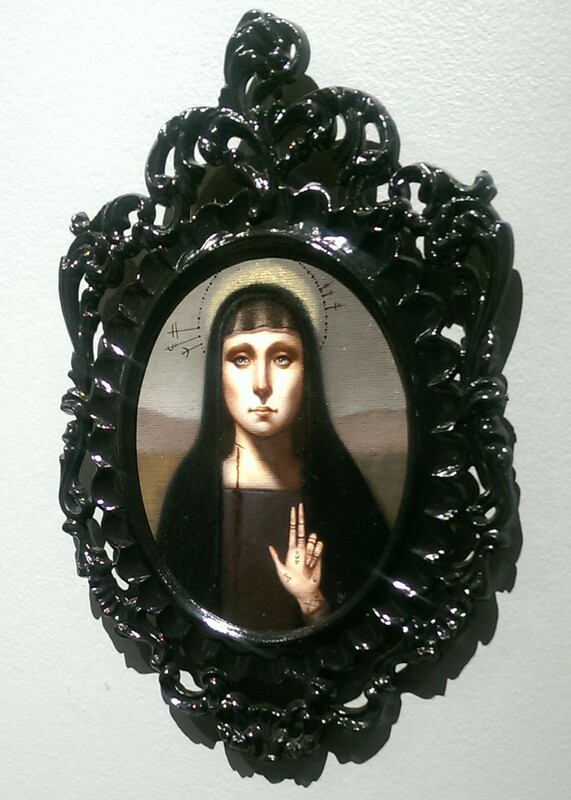 With Halloween coming up this weekend, I just had to revisit a piece of art I found while perusing Last Rites Gallery in Midtown a few months ago. This piece is called “Wounded” is by California-based artist Jasmine Worth. Several things about this piece remind me of the day we all play dress up and take candy from strangers. In England, from the medieval period up until the 1930s, people practiced the Christian custom of souling on Halloween, which involved groups of soulers, both Protestant and Catholic, going from parish to parish, begging the rich for soul cakes, in exchange for praying for the souls of the givers and their friends. I can totally see this nun as a souler in the 19th century. The tattoos on her left hand and the symbols around her head are very cryptic and almost Mayan looking. But what gets me the most about her is the gash in her neck that’s bleeding down onto her clothing. Now that’s something to go up against the Frankenstein monster with, eh? See more of Jasmine Worth’s art here.